The birds were back today. A nice show of Evening, Black-Headed and the new Rose-Breasted Grosbeak were here. Also the Western Tanagers have begun to show up. Today was the first sighting of them this summer. We still haven’t found a good way to photograph them, since they only go to the birdbath and not the feeders. The Rose-Breasted was around however he wasn’t cooperating photographically. I didn’t get the image of him I wanted, but at least he has chosen to stick around so there is time. The Evening Grosbeaks were quite friendly today, saw four of them at the feeder at one time. 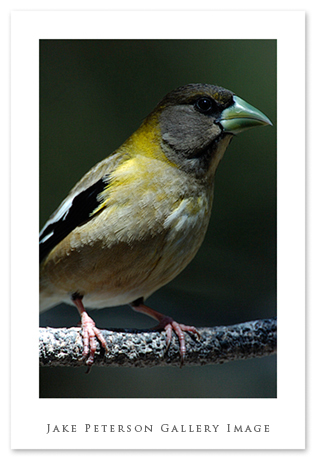 This one particular female Evening Grosbeak posed for me.